In the UK in 2017 there were two confirmed sightings of Asian Hornets with one nest destroyed. So far in 2018 there have been seven confirmed sightings, with four nests destroyed. This is a very worrying progression. 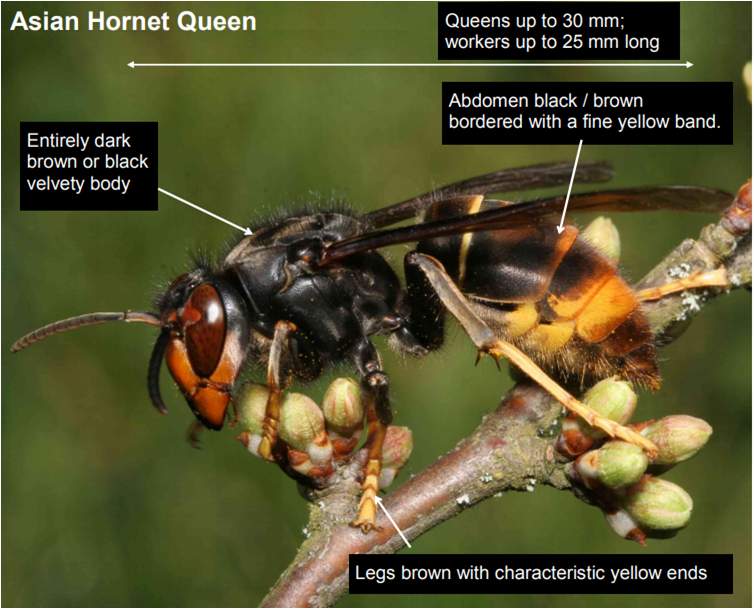 The Asian hornet poses no greater risk to human health than a bee. However, they do pose a risk to honey bees and work is already underway to identify any nests, which includes setting up a surveillance zone and traps in the two identified locations and deploying bee inspectors to visit local beekeepers in these areas. Following the successful containment of the Asian hornet incursion in North Devon last year, the UK has a well-established protocol in place to eradicate them and control any potential spread. The National Bee unit have a design for a simple hornet trap, which is also on YouTube. However, a simple wasp trap will also work, but be careful that you don't catch beneficial insects (wasps are beneficial in Spring/early Summer). The DAFM also have an information sheet which is a bit out of date. However, it has good pictures and information about informing about any hornets found.